The Stealth Cam G30 embodies the reinvention of the concept of wildlife surveillance cameras. With this impressive product, you virtually get three cameras in one, so you can select from any of the three digital scouting formats to suit your purpose. 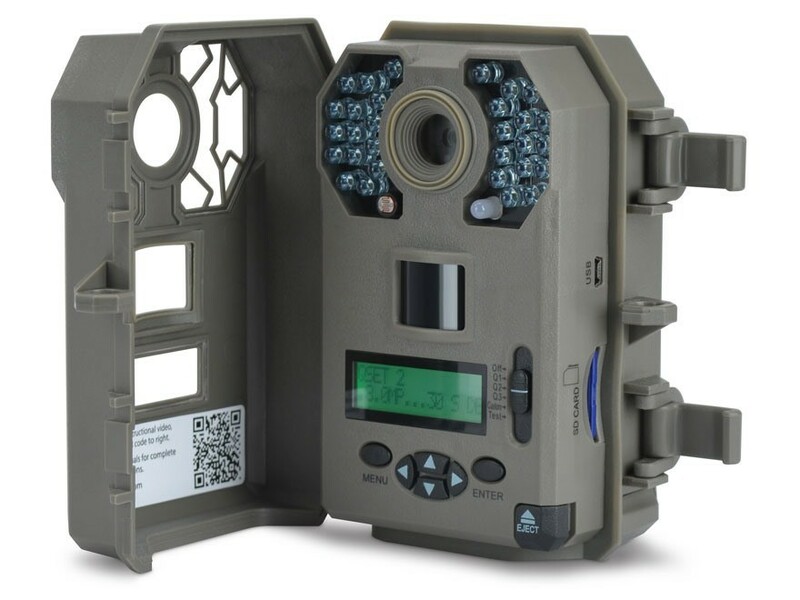 This trail camera comes with impressive features and functionality that make it a top seller in the industry. Producing crisp, clear images, which is the very basis upon which scouting cameras are designed, the Stealth Cam G30 is able to shoot still images with awesome clarity and sharpness in detail, day and night. The unit is TRIAD-equipped, with its impressive three resolution settings to choose from: 2MP, 4MP and 8MP, so you can select the best setting you want during surveillance. The unit also delivers high definition video recording from 5 to 180 seconds with audio, so your images are well supplemented with sound to enable you to filter out noise from true background audio. The time lapse function with passive infrared (PIR) override receives info about temperature and motion, which works by detecting a difference between a moving object and its surrounding environment. Once this is sensed, the camera captures the image, which could be that of a reptile, bird or large animal, even vegetation. This PIR function lets you know what triggers the trail cam to take a picture so it helps you weed out the possibility of false positives. Boasting multiple exposures per triggering, the trail camera features the revolutionary Burst Mode system. The Quick Trigger speed is supplemented by this quality, which allows the unit to take photos of a predetermined amount of images from 1 to 9 before it stops and resets, instead of capturing just one image when it is triggered. This supplies you with as many images as possible of a passing deer, for instance, so you can monitor movement effectively over a bait pile or food plot. The rapid trigger time enables capture of a series of photos that would otherwise be missed by units with much slower trigger times. Equipped with 30 infrared emitters and an impressive 80-foot range, the Stealth Cam G30 offers a pretty wide coverage so you can see both near and far. The Matrix™ blur reduction technology ensures impressive captured images even on a heavily used deer trail, so you can get clear images with vivid detail. The trail cam also has Retina™ Low Light sensitivity and a 16:9 Wide Image Ratio, so it can capture images even when lighting conditions are far from being ideal and still ensure good resolution. The camera shoots high quality video with audio so you can maximize a new dimension to surveillance for a true observation advantage on the deer’s vocalizations and behavior. The time lapse function lets you position the camera next to a food plot so images are snapped at predetermined intervals, letting you select the hours and the minutes within those hours you want the trail cam to snap photos. When you return, you can then watch a full day’s worth of activity in only a few minutes. This feature is most effective for observing deer behavior at dusk and dawn. The camera has a recovery time out between 1 to 59 seconds, which enables it to recycle or start up quickly and in sufficient time after snapping a shot. If you want to learn as much as you can about the wild game you are after, this trail cam’s Data-Stamp options provide you with the information you need on every image taken. This model comes with Time, Date, Temperature, Moon Phase and even a Name Stamp for effortless identification of the specific unit from which an image is taken. The highly useful GEO-TAG GPS Tagging embeds GPS coordinates of the unit’s location automatically onto maps so you can perform game movement tracking and placement of units more effortlessly. Built with an extra-strong case, this camera ensures there’s enough protection for all its sensitive internal components, efficiently shielding them from the elements so the unit can be left in the wild in nearly any kind of weather condition. The large-capacity 32GB SD card slot offers immense storage capacity options so you won’t have to visit the camera too often and make your target game animals aware of your presence much easier and sooner than you become familiar with their behavior. The external LCD status display lets you view the settings for error-free use. The camera also enables you to protect the images you take from curious eyes and unwanted theft thanks to its secure password protection. The trail cam’s Test Mode ensures that the unit is properly setup. The USB output offers connectivity as well as versatile charging options. This trail cam runs on 8 double-A batteries and has a low battery indicator so you can replace or recharge the onboard batteries promptly. It has an external power jack for use with the 12-volt battery box for hassle-free fuel cell charging.